Ek Ladki Ko Dekha Toh Aisa Laga Is A Golden Opportunity Turned Silver! A closet door has been opened, calmly yet decisively and resonantly: it remains to be seen what – and who – comes out of it. 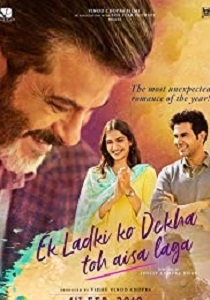 “Ek Ladki Ko Dekha Toh Aisa Laga,” directed by Shelly Chopra Dhar, isn’t really a romantic comedy in the Bollywood sense — courting, squabbling, wedding. (Though there is a very on-brand song montage with Sweety and Kuhu hugging among ruins.) Instead, like Sahil’s musical, “Ek Ladki” has to give lessons, tackling topics like shame, community acceptance and anxieties about gayness as illness.